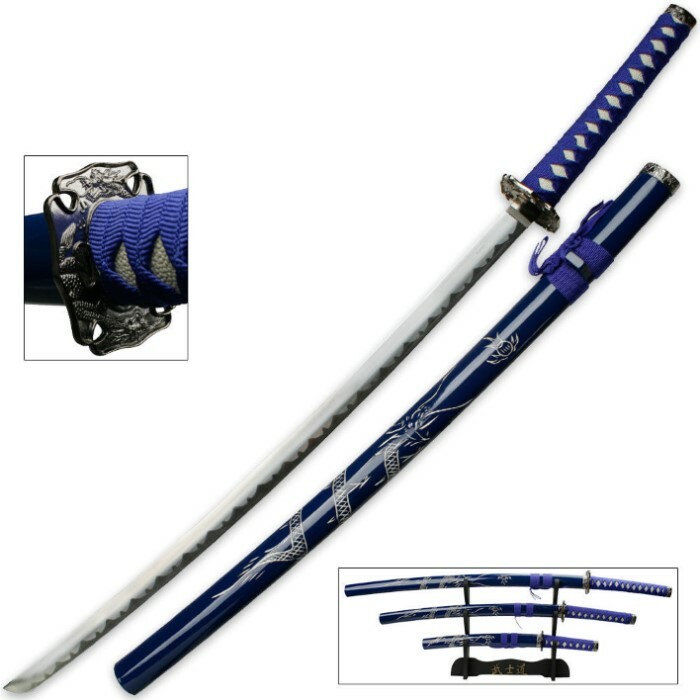 This Japanese Katana, Wakisashi, and Tanto sword set comes with the vivacious dragon and rising sun artwork etched into the wooden sides of each scabbard. 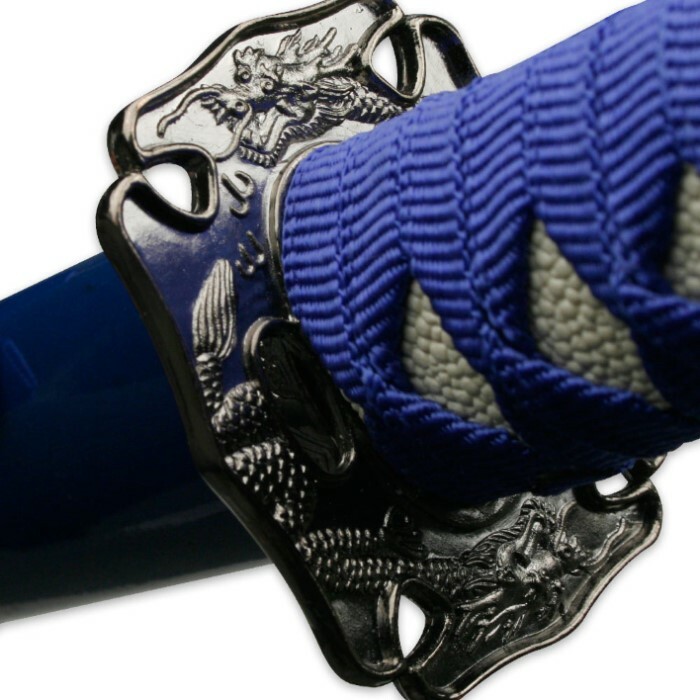 The hardwood handles come with nylon cord wrapping and are accented by the decorative tsuba and pommel. The scabbards come with a clear coating for protection and matching nylon cord wrap. Katana: 36 1/2" overall, 25 1/2" blade. Wakisashi: 27 3/4" overall, 18" blade. Tanto: 18 1/8" overall, 10 1/2" blade. This package includes all three swords and the table top display stand shown above. The stand features "Bushido" written in Japanese with golden letters, meaning "The Way of the Warrior". Not a bad set for the price, though I do have an issue with the ito or braided cord. The end of the cord is glued near the hilt and sticks up enough to slightly stab you in the hand any time you hold it. It is the same on all three blades. Bit of a disappointment, but it is a discount set. Great price and beautiful display for your collection . 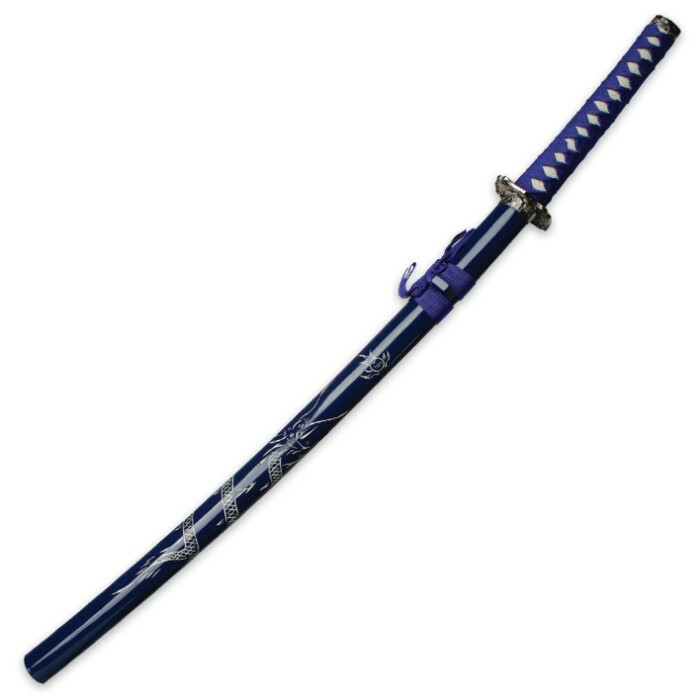 If you want to have practice swords or fighting swords , you'll need to Dig deeper in your pocket . These are great display swords.. But really nice. Just got my set in today, I am just using as display in an office. I dont intend to think I am a ninja now, this is a great set given what it is and costs. 3 swords, a stand for less than 40 bucks. If you are thinking its crap, well, I dont want to get inot combat with it, but for a display unit this is great. good quality scabards, decent wood rack and the blades are significantly sharper than I anticipated. I was expecting realy dull blades, but I was surprised. Again, f you are going to actually use it, then you should probably rely on a different set. But if you want a cost effective set for display, this is by FAR a great deal. Awesome. Just plain awesome. They arrived in a long, rectangular box. The pictures on the site are exactly how it looks. Fantastic quality, fantastic price! The swords came pre-oiled. As the other reviews said, not sharp but the tip is pointy. The display rack was hard to put together, took some muscle and a hammer to make it fit. All and all, great buy! Recommended to anybody. Good desplay peice. Not sharp but very sharp points.